I read Janna MacGregor's debut romance, The Bad Luck Bride, last year and absolutely loved her storytelling. Ever since I have followed her as she expanded The Cavensham Heiresses series. soul stirring, heart touching and so beautiful that it will stay as a fond memory in my heart for a long time. I was hesitant and frankly not very interested in reading about Lord Paul. Not a likeable character, I didn't think the author could change my perception of him and so with my mind set that nothing would make me like Lord Paul, I started reading this book, and oh my God! By the end of the book, he became my favourite hero from this series till date! 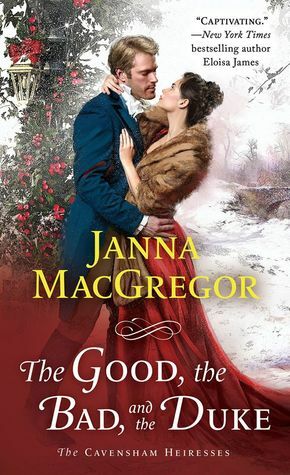 This is a book best appreciated when read in order and so Njkinny recommends that you read the previous book in this series before reading The Good, the Bad, and the Duke by Janna MacGregor. In this book, Lady Daphne Hallworth, younger sister of Lord Paul Barstowe's estranged best friend, loses her precious journal containing entries that can not only ruin her but also her family if they are made public. In her quest to catch the thief, she meets Paul who offers to help her in exchange for her help in redeeming and repairing his relationship with her family. Daphne has harbored feelings for Paul since long and it was a poignant journey to their happily-ever-after where they trust each other implicitly and despite all odds never stop loving one another. I enjoyed every second spent reading this book and loved revisiting the beloved characters from the previous books. Daphne is a strong heroine and she went after what she wanted. I adored her character and swooned over Paul who became the perfect hero -saviour of damsels in distress, hard on the outside but soft hearted with a wounded soul on the inside and with a body like Adonis. The romance is full of memorable moments and had me crying big tears and then laughing aloud in happiness. All in all, I absolutely loved this book and am eagerly awaiting the next book in this series. A love story that will make you believe in the healing power of love, the role of trust in making long lasting relationships, and show that even people like Lord Paul who made so many mistakes in the past, deserve a shot at a happily-ever-after, I give this amazing book 4.5 super shiny stars out of 5. 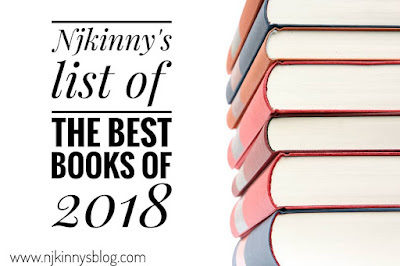 I feel it is one of the best books of 2018 and Njkinny recommends The Good, the Bad, and the Duke by Janna MacGregor to all historical romance lovers. I received an ARC book for review from the publisher via Netgalley and I am very thankful to them. The above is my honest and unbiased review that is in no way influenced.